If Apple’s Ping Is Social, Then Where’s My Facebook Friends? The social music network is empty. Why can’t I add friends from other networks like Facebook? 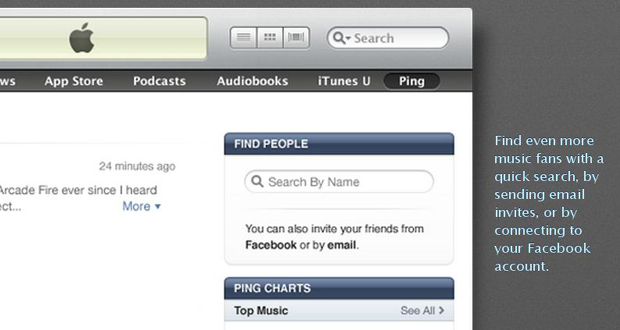 Yesterday, Steve Jobs boasted of iTunes’ 160 million users when introducing Ping, Apple’s new social music network. But anyone wading into the service this morning will find an empty community save a few artists (Lady Gaga, Yo-Yo Ma) and a few potential followers (Rick Rubin). Sure, early adopters are always a small crowd–but this is Apple, not some startup. Shouldn’t we expect Ping to be a vibrant social network? Shouldn’t there at least be some auto-integration with my other networks, namely Gmail, Facebook, and Twitter? Apple thinks so–the company even claims that iTunes 10 users can connect to Facebook. Yet that connection is nowhere to be found. Here’s why. First off, how does one find “People” on Ping? When downloading iTunes 10, Apple suggests on its website: “Find even more music fans with a quick search, by sending email invites, or by connecting to your Facebook account.” But since a Facebook account can’t be connected as promised, one must depend on quick search (impossible to search for friends when they are not registered on Ping) or email invites (a pretty desperate method to finding buddies). So where did that Facebook incorporation go? Answer: Out the door because of Facebook’s demands for “onerous terms,” says Steve Jobs. All Things D caught up with Jobs yesterday at the press conference, and asked why Ping didn’t have Facebook sharing or linking–the process of syncing friends from another social network. Jobs explained that they had held meetings with Facebook for “a variety of unspecified partnerships” but that discussions had hit a dead-end. Though it’s unclear what Jobs meant by “onerous terms,” it’s possible that the talks had ended over the different usership of each service. Facebook’s network is all about sharing; Ping’s service is aimed at buying. That is, in order to register for Facebook, one needs an email address; in order to become a member of iTunes, one needs a credit card. Ping’s central purpose is to foster more song purchases through friend and artist recommendations. The question then becomes: If Facebook allowed its users to port over to Ping, would they have to add credit card information? Would Facebook have access to this data? Does Apple even want Facebook co-opting its users (and vice-versa)? The same can be said of other networks such as Google and Twitter–but what about MySpace? It’s interesting that throughout this Facebook-Ping debacle, no one has even brought up MySpace integration. The once-popular social network made a name for itself through music and music streams, but if Ping works–providing users a streamlined social network with artists and one-stop shop for music and other media–MySpace will become irrelevant (if it isn’t already). Still, it’s no surprise that MySpace and Facebook are popular among record labels and artists–wouldn’t an incorporation with the service instantly bolster Ping’s artist social network? Currently, its artist community is limited and eclectic: U2 and Katy Perry, Linkin Park and Jack Johnson, Diddy and Taylor Swift. Wouldn’t iTunes want to expand that part of its social network? Ultimately, Ping isn’t focusing on Facebook or MySpace integration as much as it is focused on selling music. Ping is an inherently store-based social network–it cannot even be accessed without first going through the iTunes store. Most importantly is iTunes’ huge user-base of registered credit card members–the service boasts more than even PayPal! How many could Facebook possibly have?